The Frenzel + Berg CANopen single chip controllers are low cost, high performance kernels for easy CANopen device development and especially designed for automotive and industrial applications. Each chip offers the complex implementation of the CANopen draft standards used for the corresponding device. 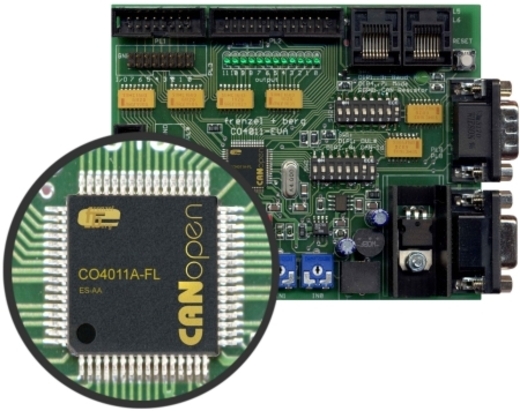 Only a few additional components are required to realise a complete CANopen module. No additional programming is necessary. Evaluation boards are available for all chips. Data sheets and more information on our homepage. User specific versions on request. CiA®, CANopen®, and CANopen FD® are registered EU trademarks of CAN in Automation e. V.